The Tulip Beer Glass also known as the 'Straight' Beer glass has become the standard beer glass used in most pubs, clubs and venues the length and breadth of the country. The equivalent in pint size, is the Dimple Beer Glass. 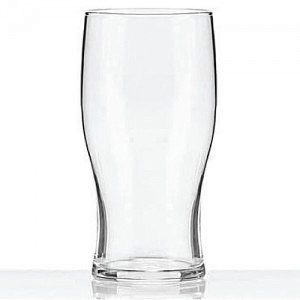 There are two main versions of the Straight Beer Glass: "Conical" and "Nonic". The Conical glass as the name suggests has a smaller glass base and widens at the top. The Nonic glass has a slight bulge close to the lip of the glass. The Conical Beer glass can be susceptible to chipping on the rim. However the Nonic glass - pronounced - 'No Nick' apparently does not suffer from this fete. Like all glasses that are manufactured and used en-masse, there are many, many variations, styles and names of beer glasses. Guinness have adopted the Tulip design and shape for advertising their famous brand. The Tulip Beer class is an elegant, easy to hold and easy to drink from shape.